We met in the governor’s office with a Jambi historian (H. Junaidi T. Noor-center), who also happens to be an adviser to the governor. This man freely spent two hours with us presenting information about Jambi’s history. 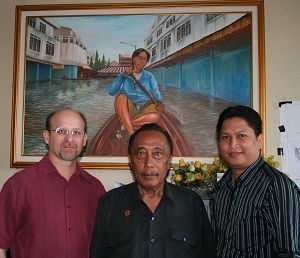 The picture in the background is Mr. Noor’s son, paddling down the streets of the City of Jambi during a major flood that took place somewhere around 2002 or 2003. We have friends and family members that won’t come to Indonesia because they fear for their safety. We want them all to know that this fear is unfounded. We have been living in Indonesia for 3 years and we have never been threatened by Muslims, in fact, all of our neighbors are Muslims and they are extremely friendly people. We have been invited to Muslim weddings and other special holidays, and they are overjoyed to have the opportunity to share their lives with us. We have visited several police departments–not while on official business, and they have been very helpful in giving us information about Indonesian life.